Cook up three batches of delicious soups, stews or other family favorites! Try this 6-Piece Stainless Steel Stock Pot Set__contemporary looking cookware to enhance your culinary skills with your family's favorite dishes. 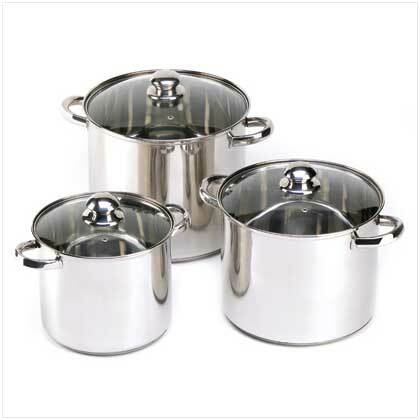 The 3 pieces in this pots and pans set are ideal as soup pots or for large quantities of sauces and pasta for a crowd. Stainless steel cooking pans with encapsulated bottoms are durable, heat quickly, and maintain even heat temperatures throughout the preparation time. The see-through tempered glass lids on these kitchen pans help you keep an eye on your food without lifting the lids. Mirror finish stainless steel Is attractive, durable, and performs well in the home or in a commercial setting. Step rolled edge Holds lid in place. Welded handles Are secure and help with lifting a heavy, hot stockpot. Encapsulated bottom Captures a core metal that help to attain quick and even heat temperatures. Tempered glass lids Can tolerate temperatures that are commonly used with this type of cooking pot.